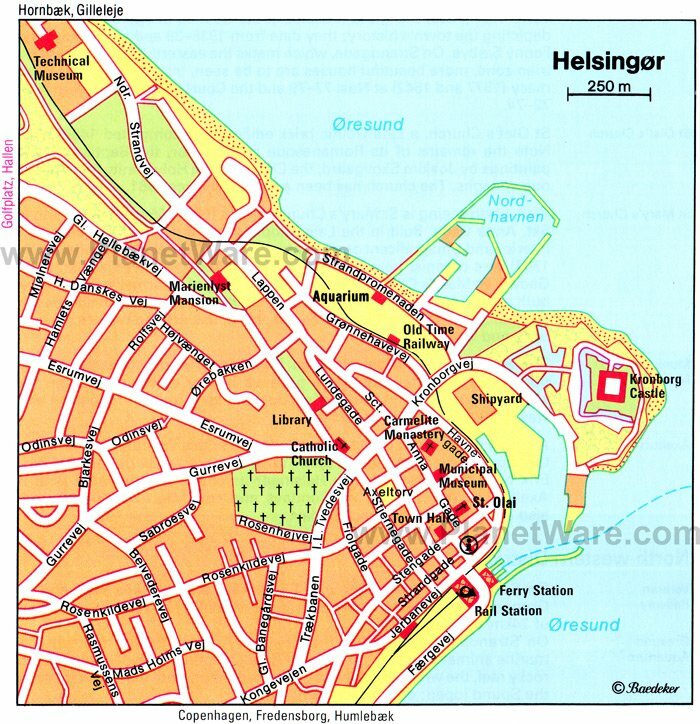 Less than 46 kilometers from the capital, Copenhagen, Helsingor is primarily a busy ferry port. Countless Swedes make the trip across the short stretch of water from Helsingborg for cheap supplies and simply to enjoy a day out. Yet, this unassuming town boasts a medieval Shakespearean past, for this is Elsinore, home to Hamlet's castle, the mighty Kronborg. The medieval quarter is particularly pleasant to explore on foot and has some fascinating buildings, such as the beautifully preserved Carmelite Monastery (Karmeliterklostret) attached to St. Mary's Church (Sankt Mariæ Kirke). Dotted about the town, you'll find quaint boutiques, atmospheric cafés, and charming restaurants. A UNESCO World Heritage Site, Kronborg Castle is the setting of Shakespeare's Hamlet and the top tourist attraction in Helsingor. In the northeast of town, on a peninsula in the Øresund, the towering edifice is plainly visible from afar. Originally, a fortress built around 1420 by Eric of Pomerania stood here. A new castle, a four-winged edifice with an enclosed inner courtyard, was built between 1574 and 1584 under Frederick II. After a catastrophic fire in 1629, King Christian IV had the castle rebuilt between 1635 and 1640. For more than 100 years, the structure served as a garrison and, in 1924, it was renovated. The Castle Chapel lies in the South Wing with a splendid Renaissance interior and woodcarvings from Germany. The North Wing contains the great Ballroom or Knights' Hall. Superb tapestries are on display in the West Wing. The recently opened National Maritime Museum is now one of the top places to explore Denmark's seafaring legacy. Set underground in the old dry docks of the revamped former shipyard area next to Kronborg Castle, and designed by renowned Danish architects BIG (Bjarke Ingels Group), the collections are dedicated to the country's rich maritime history. The informative and dramatic exhibits include relics from Denmark's conquests in Greenland, India, the West Indies, and West Africa. The area is also the site of the Culture Yard; a theater, concert venue, library, and restaurant housed in a cutting-edge glass and steel structure created from old wharf buildings. Less than a half-hour drive (25 kilometers) from Helsingor, near Hillerod, is stunning 17th century Frederiksborg Castle, an absolute must-see if visiting this area. Built in the Dutch Renaissance style, Frederiksborg is spectacularly well preserved. The castle lies on three islands in Frederiksborg Lake and was restored in its original style after a fire in 1859. Since 1888, the main courtyard has featured a copy of the Fountain of Neptune by Adrian de Vries (1623), the original of which was taken to Sweden in 1658. The Danish Museum of National History has been housed here since 1878. Adjoining Frederiksborg to the north by the lake is a superb Baroque park with pristine terraces and avenues bordered by lime trees. Built in 1559, the striking red brick Gothic cathedral of St. Olaf's (Sankt Olai) nestles in the heart of town. Named after the Norwegian King Olav, who was canonised, the church is adorned with various depictions of him. The building, originally a church, but consecrated as a cathedral in 1961, was completed in 1559, however its history dates back to the 13th century. Remains of ancient decorations adorning the old Romanesque chapel that once stood here can still be seen in the north wall of the nave. Other points of interest include Dutch alabaster altarpieces, the beautifully carved pulpit, and a number of frescoes. Well worth seeing is St. Mary's Church, about 150 meters north of St. Olaf's Church in the center of Helsingør, on Skt. Anna Gade. Built in the Late Middle Ages, the church boasts a fine interior and a magnificent organ. The composer, Dietrich Buxtehude (1637-1707), was an organist here in the 1660s and lived nearby at Skt. Anna Gade 6. St. Mary's forms the south wing of a Carmelite monastery built about 1430, later restored, and now enjoying a reputation as one of the best-preserved monasteries in Scandinavia. The cloisters, the church, and the chapter house are venues throughout the year for concerts and lectures. Just three kilometers from the town center, and in a fittingly industrialised zone, you'll find this privately funded museum dedicated to Denmark's impressive technological achievements. Stretching over some 8,000 meters, the museum is housed in a former iron foundry dating from the 1960s. There's a comprehensive collection of steam engines, various inventions, electrical appliances, bicycles, vintage cars, and aeroplanes. Alongside all this, the museum is home to a functioning pewter workshop and exhibits dedicated to the discovery of electromagnetism and the "Telegraphone," the forefather of modern tape recording. The aviation section, with more than 30 flying machines, including one that's claimed to be the first ever to take flight in Europe (sadly unrecorded), is particularly interesting. Axeltorv, to the west of Skt. Anna Gade, is the bustling hub of Helsingor. There's a fine fountain by Einar Utzon-Frank (1926) erected in memory of King Eric of Pomerania who gave Helsingor its original charter. Markets are held at Axeltorv on Wednesdays and Sundays, and from May to October, there's also an antique market each Friday. Just a couple of minutes' walk away in this medieval part of town is the popular street of Stengade with plenty of places to eat and shop. The Helsingør Municipal Museum (Bymuseet) is housed in the former poorhouse (more than 500 years old) near St. Mary's Church. The exhibits include a range of historical documents, a model of the town dating from 1801, and a collection of dolls. At one time the building was a hospital attached to the nearby Carmelite Monastery. It later became a manor house of some splendor. A museum was established here in 1973. About 15 kilometers southwest of Helsingør, elegant Fredensborg Palace was built in 1719-22 in the Italian Baroque style. Today, the palace exhibits a Classical facade and is the spring and autumn residence of the Royal Family. 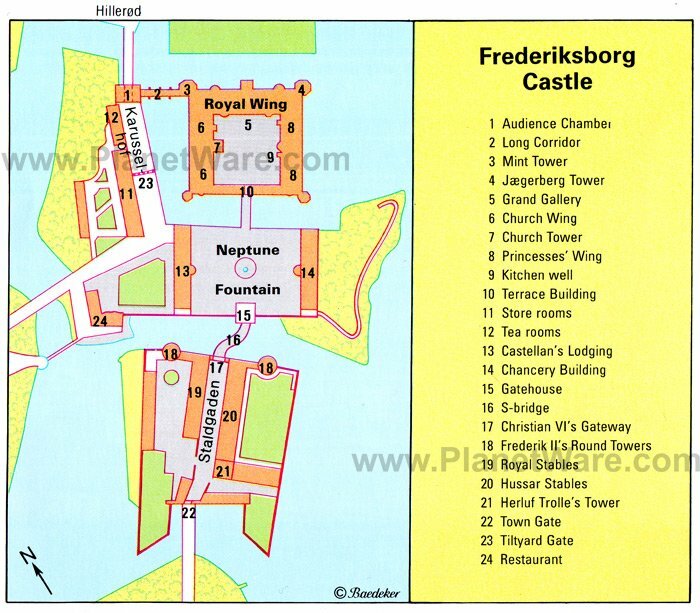 King Frederik IV named the castle "Fredensborg," meaning "Peace Castle," to celebrate the end of the Great Northern War in 1722. When the Queen is in residence, a Changing of the Guard ceremony takes place every day at noon. Surrounding the palace, the French Baroque-style Fredensborg Palace Gardens is one of the most impressive parks in Denmark. Statues of workers, farmers, and fishermen grace the grounds together with fine avenues of birches. The gardens are open year-round. Beach Hotel Marienlyst: mid-range beachfront hotel, bright rooms, indoor pool with water slide, sauna and Jacuzzi, walking distance to Kronborg Castle. Kyhns Guesthouse: affordable B&B, historical building, wonderful hosts, central location, comfy beds, delicious fresh breakfast. Hotel Skandia: 3-star hotel, friendly staff, convenient location, clean rooms. Hotel Sleep2Night: budget hotel, drive to town, free parking, self-serve laundry.